Greater City Providence sent surveys to all candidates for Mayor of Providence who qualified to be on the ballot. We planned to post the results of the survey on the website because we believe that while not everyone can get to scheduled coffee hours, rallies, and other important functions, people still want to make an informed, thoughtful decision about who will lead Providence. As of press time, the only complete survey we received was from candidate Angel Taveras, that survey is published below. Other candidate surveys may be posted as we receive them. 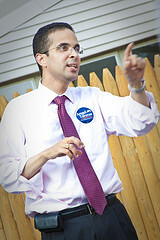 Mount Pleasant resident Angel Taveras grew up on the South Side, where he attended Head Start before the Providence Public Schools, Harvard University and Georgetown Law. A former Housing Court Judge, he was instrumental in the development of systems to support homeowners dealing with foreclosure, to streamline the interaction between Inspectors and the Court and to improve code enforcement tracking. Angel has profound commitment to public service; Angel was a founding board member of New Urban Arts, served on the board of the Providence Plan, on the International Institute’s Board of Advisers, and was a founding member of RI Latino PAC. It isn’t always necessary to reinvent the wheel when it comes to best practices. Across the globe small cities like Providence are doing amazing things to make their cities more livable, increase their tax base, and improve services. What city (or cities) do you look to for inspiration of what you would like Providence to be like or to strive for? What are the characteristics of those cities that you think Providence should emulate? Providence can learn from the best practices at work in different cities across America. I will name here just a few. Portland, Oregon: Portland is a national leader in light-rail and streetcar transportation. As Mayor of Providence, I will look to Portland in designing twenty-first century transportation infrastructure that reduces road congestion, protects open space and promotes green, sustainable living. New York City, New York: New York City is a national leader in education reform. Under the leadership of School Chancellor Joel Klein, the NYC DOE has dramatically increased student achievement by creating small schools, focusing on teacher recruitment, training, evaluation and development and by supporting high performing urban charter schools. Chicago, Illinois: The City of Chicago has done exemplary work in using twenty-first century technology to deliver city services and respond to constituent needs. Chicago was one of the first American cities to implement a “3-1-1″ hotline for non-emergency requests and the City has won awards for using the system to predict and prevent weather related disturbances. Seattle, Washington: Seattle has done impressive work in the area of environmental sustainability. Specifically, Seattle lowered their 2008 emissions by 7 percent below 1990 levels, despite undergoing a population increase of 16% during the same period. Seattle also has an urban composting program that I will replicate as Mayor. Newark, New Jersey: I traveled to Newark to campaign for Cory Booker and I truly believe that he is one of the best urban Mayors in America. His direct communications with voters via new media and his regular night patrols with the police department – both to build relationships with the police and to build trust with the community – are two characteristics that I will bring to the office of Mayor. Our city’s infrastructure has been poorly maintained for decades. Streets, sidewalks, parks… all are in dire straights across the city. The city needs a comprehensive plan to fix what is broken and maintain our infrastructure properly going forward so that we do not return to the sad state we are in now. How will your administration address our infrastructure crisis managerially and financially? Infrastructure matters. And it will be a top priority for my Administration. Our City cannot succeed without first guaranteeing that we can maintain strong and safe streets, bridges, sidewalks, sewers, parks, school buildings and other infrastructure needs. Technology can help in this regard. I will create a citizen dashboard using state of the art technology so that City residents can report potholes, broken streetlights or jammed traffic meters with their cell phones. Anyone who reports a problem will receive a personal follow-up email that details the actions taken to solve the problem. Regarding known infrastructure problems, we will start at square one. My administration will create a public database of every piece of City infrastructure in need of repair and prioritize based on safety and cost effectiveness. Whether through leveraging federal and state dollars or issuing bonds, we will find the resources necessary to maintain our City’s infrastructure. We need these changes because the status quo is simply unacceptable. For too long, patronage has governed which streets get plowed or which roads get repaired or which house got a new sidewalk. In my administration, infrastructure repairs will be conducted by need and not by politics. I want to note that while I recognize the need for a city-wide, comprehensive plan, I am also specifically committed to infrastructure improvements in the City’s emerging Knowledge District and other coordinated economic investment zones. I will invest in transportation infrastructure, fiber optic communication lines, labs and business incubators, and other infrastructure improvements in water, sewer, gas and electric services. I am convinced that these investments will help continue to transform the Knowledge District into Rhode Island’s center for creativity and entrepreneurship. This goes hand in hand with infrastructure, but specifically tell us, how your administration will ensure that all of our city parks in all neighborhoods are properly maintained. On Earth Day, I announced a 5-point environmental plan that prioritizes composting, investments in renewable energy, increased energy efficiency in public buildings and stronger city support for urban gardening. I am also a big advocate of our city’s parks. These green, open spaces improve air quality, engage citizens in the stewardship of land, increase property values, build community amongst neighbors, and preserve water and wildlife. We have made much progress in our Parks department in the last decade, such as the 2006 Street Tree Inventory, the city’s first skateboard park at Neutokancanut Park, solar powered lighting systems at Amos Early Park and Donigian Park, the increased use of recycled materials in the construction of city parks and the development of 2 dog parks and 17 walking and jogging tracks. But, there is much left to do. From our 97 neighborhood parks to our 11 downtown parks to Roger Williams Park to the Recreation Department’s athletic fields to the North Burial Ground and Locust Grove cemeteries, we need both more effective management of these grounds and increased partnerships with the surrounding neighbors. As Mayor, I will create a state of the art citizen dashboard with which neighbors can work hand in hand with the Parks Department to ensure timely and effective maintenance. Haphazard and unresponsive maintenance efforts of our city’s environmental treasures and recreational areas will simply be unacceptable in my administration. Finally, as Mayor, I will be a strong advocate for increased open space, tree plantings, community gardens, city parks and the development of our urban canopy. Though there is interest from the Universities to build on some of the land being vacated by the old Route 195, the current state of our economy means that it will likely be years, perhaps decades before that land is fully developed. How would you like to see that land used in the interim with an eye toward the long term, between when the highway is removed in 2012 and when development finally takes place? Throughout my campaign, I have had the opportunity to speak with the some of the top leaders of our local colleges and universities. One issue that continually comes up is the development of the land being made available by the relocation of I-195. The parcels that are coming available present a truly once-in-a-lifetime opportunity for the City. My priorities are as follows. First, the land must be used as an economic engine for City residents – both in the construction process and afterward. Second, the land must pay taxes to the City, period. And third, the development must be 100% environmentally-friendly and create open space for the public. Providence is home to a large number of tax exempt non-profits, schools, hospitals, the state, etc. The inability of the city to assess taxes on this exempt property is a perennial issue. Many of the tax-exempt institutions provide a large number of jobs for city residents and spin off economic activity throughout the city and region. What will the city’s relationship be with these non-profits under your administration? The City relies on its tax-exempt organizations – hospitals, colleges, universities, non-profit organizations and private secondary schools – for employment, for innovation, for recruiting new talent and so much more. Without these great institutions, Providence would not be half as great a City as it is today. And yet, there are some challenges associated with hosting so many tax-exempt organizations. One is, of course, collecting property tax revenue. The non-profits in Providence own 40% of the City’s real estate and contribute less than 1% of the City’s revenue. In 2003, the City negotiated a breakthrough PILOT (payment in lieu of taxes) agreement that was a step in the right direction. Today, however, the financial shape of the City is in worse shape and I believe a new PILOT agreement must be reached. I am committed to working collaboratively, to bringing the non-profits together to find a new path that supports their continued growth and expansion while also protecting the Providence taxpayer. Late last year RIPTA and the Transit 2020 working group released the Metro Transit Study looking at mass-transit in an area which basically covers everything inside Route 295 (more or less). Among the recommendations of the Metro Transit Study were a starter streetcar line for Downtown Providence. At the Metro Transit Study press conference, Mayor Cicilline acknowledged that the city may need to contribute some money to funding this streetcar. Do you agree that the city will need to contribute some funding to the construction of a streetcar line, and if so, where will the city get money for this? What other sources of revenue do you see being tapped to create a Providence Streetcar line? I support the Transit 2020 working group’s recommendations and they are included in my transit plan for Providence. I support streetcars. The proposed “Meds to Eds” line, for example, holds great potential to recreate our City’s layout and bring new vibrancy to our City’s changing neighborhoods. A public investment from the City may be necessary. First, I will exhaust all available options such as federal transportation grants, stimulus dollars and other publicly accessible resources. If additional money is needed, revenue bonds tied specifically to fare collections may be a feasible alternative to financing the streetcar project. Assuming you have reviewed the Metro Transit Study, please speak about your thoughts about some of the study’s other findings and your personal views of transportation issues in the city and metro area. I do support the other recommendations of the Transit2020 study, including increasing transit connectivity from Providence to other locations like T. F. Green Airport, making Kennedy Plaza a more effective intermodal transportation hub by creating satellite hubs throughout the City, working with regional partners, including the Massachusetts Bay Transit Authority, to develop a unified fare system and developing a bicycle superhighway, including a dedicated bike lane on every major thoroughfare, to support bicycle riding as a feasible alternative to driving. The bottom line is that a twenty-first century public transportation system will make Providence both a more livable and a more economically competitive city. High quality public transit improves environmental quality, reduces traffic congestion, protects open spaces and connects residents with businesses and other city institutions. Simply put, public transit is a capital investment that we cannot afford not to make. Cities and states across the country are enacting Complete Streets legislation. Are you familiar with the Complete Streets movement and what will you do to ensure Providence’s streets are safe and functional for all users? I am familiar with Complete Streets. As noted above, making Providence a pedestrian and bicycle friendly City is a top priority for my administration. I have an ambitious plan to invest in public transportation infrastructure and to develop safe and environmentally friendly alternatives to driving. Other mayors have committed their cities to reducing automobile ridership by 25%-50% by investing in public transit. This is the kind of bold thinking we need here in Providence and it is the kind of vision that I plan on bringing to City Hall. The city has an ordinance which states that the abutting property owner must remove snow from sidewalks. This ordinance has gone un-enforced for years creating a major public safety issue for the city’s residents every time it snows. The city and the state are notable offenders in not clearing snow from sidewalks abutting their property (sidewalks abutting parks, public buildings, on overpasses, etc.). How will you hold private property owners, the state, and the city itself accountable for removing snow in a timely fashion, and how will you ensure that snow removal ordinances are enforced? The status quo is unacceptable. If we want a walkable city, it has to walkable 12 months of the year. Other, far snowier cities have far higher standards of behavior for snow removal. There is no excuse for Providence not to remove snow as effectively as other Northern cities. The City and State must do their part on all of their properties. As Mayor, I can assure you that Providence will lead by example with public property. The Rhode Island Department of Transportation has a responsibility to clear snow from highway overpass sidewalks. I will develop a way to get snow removal assets onto these critical walkways, no matter where they are in the City. In the neighborhood, I believe that citizens have to lead by: (1) setting the example; (2) working with neighbors to help those who cannot shovel; and (3) reporting dangerous situations. In the parks, I believe we have an opportunity to innovate. Why not work with neighborhood groups, perhaps youth organizations, to complement the work done by the Parks Department and make outstanding snow removal a point of pride for Providence residents? The bottom line is this: as Mayor, I will enforce this ordinance to ensure that Providence walkers, bus riders and bikers have clear travel to work and school. After adequately informing the public about the ordinance and its importance through traditional and new media, I will direct my Public Safety Commissioner to create a plan for enforcing the ordinance. Our city’s diminutive size makes it ideal for cycling. Cities such as New York, Boston, and Portland have been implementing more bike friendly street plans that offer an alternative to bringing more cars into the city. How will you work to improve bicycle infrastructure within the city of Providence? In a City of our size, biking should be a feasible, safe alternative to driving for residents getting to work, to school or to Downtown on a Friday night. The reason more residents do not bike is simple: the poor shape of many of our City’s streets make biking simply unsafe! I learned this firsthand a few months ago during Bike to Work Day. As Mayor, I will oversee the development of a city-wide bicycle plan that includes a dedicated bike lane on all major thoroughfares. It is absurd that one can bike to and from work in a place like New York City easily and safely but not in a City of our size. Boston, New York, and other cities are formally researching how their communities will need to respond to growing issues regarding climate change. Environmental challenges include rising sea levels, heavy rains or snow from more intense storms, potentially deadly heat waves, and impacts on the electrical grid due to higher demand during heat waves, all complicated by our built environment–heat island effect and stormwater runoff. How will you ensure that Providence is looking forward and prepared for a changing climate, and what are some of the issues you anticipate the city facing in regards to climate change? As Mayor, I am committed to decreasing our carbon footprint and being a national leader in environmental stewardship. My environmental policy platform includes the development of a citywide urban composting program, filling the vacant position of city energy manager tasked with identifying concrete ways to reduce the city’s energy spending, boost our energy efficiency and significantly decrease our carbon footprint, ensuring that all City owned property and vehicles are as environmentally friendly as possible and establishing a green energy renewable revolving fund so that our small businesses can join the city in investing in green technology. As the March 2010 floods showed, what constitutes a “100-year flood” has gone up several notches. My administration will make disaster preparedness and overall resilience a priority. Whether it is a flood, snow or ice-storm bringing down electrical wires, my administration will be connected to the City like none other. Previous administrations introduced a mandatory recycling program which was plagued by a confusing launch and still does not have full compliance. Reducing the amount of refuse we send to the Central Landfill is not only good for the environment, it is good for the bottom line. How will you get more people (residents, businesses, schools, government) to recycle more items? A strong communications program is essential for developing new policies in Providence. We need to use traditional and new media, communications with neighborhood associations and the thousands of our city workers to properly educate the community about important policy changes. My administration will have a strong communications system that brings people together to increase education and advocacy in support of our recycling program. In addition, we need to focus on composting. Approximately 20% of Providence’s municipal waste could be composted. The City should develop a city-operated composting facility that accepts all organic waste from city properties and turns it into compost for use in neighborhood parks and community gardens. Lastly, Providence should work to ensure that more household refuse is recycled. We currently prohibit households from recycling goods that other cities treat as recyclable, including plastic tops, pizza boxes and beverage cardboard. Obesity and related illnesses pose serious risks to many in our community. In a world where a big mac costs less than a salad, how will your administration ensure that all residents have ready access to affordable healthy food choices in their neighborhoods? In addition to diet, children and adults need safe places for exercise and other recreational activities year-round throughout the city. What programs can you point to that promote exercise and how will your administration expand those programs and increase residents ability to live healthy lives? I am deeply concerned about the health and wellbeing of Providence residents. Without healthy residents, Providence will not be as successful a city as it can and should be. By investing in public transportation, sidewalk improvement and bicycle lane development, I hope to move residents out of single-occupancy vehicles and into a more active life style. On food, I support and look forward to partnering with organizations like Farm Fresh RI to ensure that our residents have access to year round farmers markets. I also think we need to reexamine what kind of food our school children are eating for breakfast and lunch and find ways to maximize nutritional value for our youngest residents – including partnerships with local farms to bring local produce into our schools. Recently, some American cities have taken steps towards enacting new regulations that discourage unhealthy lifestyles (sugary sodas, fatty foods) and encourage health and wellness. New York City’s ban on trans-fats and requirement that caloric information be displayed in fast-food restaurants are two examples of this. As Mayor, I will work with public health professionals to gauge the impact and effectiveness of these programs to determine if they are the right fit for Providence. I look forward to leading by example on this issue. I will proactively encourage city residents to walk, bicycle and eat healthy by not only advocating for it, but also by doing it as Mayor. As Mayor, I also intend on visiting our city’s schools early and often and talking to our children about these important issues. The foreclosure crisis has hit Providence hard, resulting in many vacant buildings throughout the city and forcing renters out of foreclosed homes. How will you curb the foreclosure crisis, reduce the number of boarded up homes, and ensure that renters can stay in their homes? Furthermore, as we climb out of the recession and build our economy, how will your administration counter the effects of gentrification and ensure that the city maintains attractive affordable housing stock for all? Affordable housing not only for those families living in poverty but also work force housing for the middle-class. As a former housing court judge, I am all too familiar with the personal, heart-wrenching stories of local families and their struggles to stay in their homes. As Mayor, I will use our state’s receivership law to place abandoned houses into the hands of local housing non-profit organizations who can rehabilitate and offer them as affordable housing in the neighborhood. I will aggressively pursue the big banks and irresponsible lenders who gave out the toxic loans that got us into this crisis (other cities like Cleveland and Baltimore have already done this) as well as the growing number of rescue scam operators. I will direct my Office of Neighborhood Services to work with Rhode Island Housing in maximizing foreclosure prevention outreach efforts in Providence. My Office of Neighborhood Services will also work to connect eligible applicants on the Providence Housing Authority waitlist for emergency interim housing opportunities. I will ensure that our the City’s foreclosure mediation requirement is strictly enforced. I will use all resources at my disposal to obtain additional housing units for the Providence Housing Authority. I will invest in lead hazard and other environmental toxin removal programs, as well as programs that assist in weatherization and other energy conservation measures. And finally, I will direct the Providence Housing Authority, in partnership with the Office of Neighborhood Services and nonprofit community organizations to offer financial literacy education to homeowners and prospective homebuyers. These literacy programs will assist low-income borrowers in accessing low-cost credit, avoiding risky financial instruments like subprime loans, taking advantage of refinancing options and improving their credit histories. During this “Great Recession” there has been a lot of talk about regionalism as a way for municipalities to reduce costs though not much of anything has been done past the talking stage. Do you support regionalism? If so, what functions/services do you envision being regionalized, and how will you get surrounding municipalities on-board with a regionalism scheme? I support regionalism and as Mayor, I will lead a coalition of Mayors that identifies and eliminates redundancies between Providence and our neighboring cities and towns. We should look first at purchasing practices and service delivery. By collaborating with other cities and towns we may be able to achieve economies of scale in health care, for example, or school supplies. Similarly, we may also be able to work smarter and respond to emergencies better by exploring new partnerships in our public safety departments. Providence has a recent history of large scale public works projects, moving the rivers and now moving Route 195. Pretending for a moment that money is no object, what do you think should be the next mega project Providence should tackle? Providence should retrofit all of the public buildings in our city – including all of the schools, municipal buildings and public housing facilities – with state of the art energy efficiency and renewable energy technologies. This massive undertaking would create the economy of the future: putting hundreds of Providence residents to work in green jobs, reducing our city’s carbon footprint and saving taxpayer dollars. There are stimulus and federal funds for this kind of bold undertaking and, as Mayor, I would push for Providence to be at the forefront of creating green jobs and a sustainable future. Please write a short statement for the readers of Greater City: Providence about why you should be Providence’s next mayor. Thank you, Greater City: Providence for creating this survey and giving me the opportunity to share my policy platform with your readers. Your civic spirit shines out to the nation through this grassroots project and all others like it. I support your work and believe that you make Providence a more livable city. My name is Angel Taveras and I am running for Mayor of Providence because I love this City and I know that, together, we can build on the momentum of progress and continue to move the City forward. I was raised in this City by my mother, Milagro, after my parents divorced. She worked long hours to put food on our table and clothes on our backs. With her guidance, I went from Head Start to Harvard through the Providence public school system. After college, I started an afterschool and summer program for children here in Providence, earned my law degree from Georgetown and returned home to practice law at Brown Rudnick. As an attorney, I have represented some of the largest businesses and organizations in the City of Providence. I have also represented some of the most vulnerable and powerless individuals. Through my work as a lawyer, as a Housing Court Judge and as a Board Member of community organizations like New Urban Arts and others, I have seen firsthand the many devastating effects of the City’s recession and foreclosure crisis. That is why putting people back to work and investing in our economy is my number one priority as Mayor. I encourage you to visit my website and read my recently released 17-point jobs and economic development plan. As a proud alumnus of the Providence school system, I am passionately and personally committed to dramatically raising student achievement in Providence schools. And I am committed to changing the way Providence City government works. Our City has made great strides in the last eight years in ending “pay-to-play” politics and putting our history of patronage and corruption behind us. As the only candidate in this race who does not accept campaign contributions from city employees or city vendors, I am committed to a new era of open, honest, ethical and transparent government. I encourage you to visit my website, AngelforProvidence.com to learn more about me and the issues that I care about. Please do not hestitate to contact me personally at angel@angelforprovidence.com or at (401) 484-1244. This is quite possibly the most important thing on the ‘infrastructure’ front. Not only will it help make the city accountable for what it built, it will also help grant-writers capture outside money in oddball grants and apply it where it needs to go. I’d also like to see a ticketing system with it so we can see how many person-hours stuff took to fix. I think it is very unfortunate (and frankly, depressing) that none of the other candidates found the time to respond. I am making my decision carefully as I always do…and I always vote. I am a social worker and nearing retirement and a very limited income. I live on the east side. I am wondering if some group of able people of all ages could be gathered to help those of us who cannot shovel snow and, especially maintain safe sidewalks at our homes as we get the freeze-melt-freeze phenomenon which is a constant during the Providence winter. Young and not-so-young able people need jobs and many have the flexibility to provide such a service. Do you think you could organize such a task force and pay them enough to make it worth their time. It also could be a part of the “community service” requirement through high schools, colleges and other agencies that serve kids and underemployed folks. Someone(maybe me) could volunteer to organize such a project. I am very impressed, with the way Mr Taveras has answered all of the questions in this extensive survey. I am very pleased with the plan that he plans to implement. I have no doubt that he is commited to the city of Providence and its citezens. I congratulate and commend mr. Taveras, and wish him the best of luck in all of his future endevors. One of Americas statesmen stated “government is not the solution to our problem; government is the problem.” His presidency ushered in an era of disdain for government and a widespread cynicism that government could be effective in addressing our challenges. Today, as we confront a crisis that has shaken confidence in our financial system and economy, we have an opportunity to restore public trust and confidence in the legitimate role of government. Indeed, to effectively tackle our economic challenges and to implement the reforms we need in our healthcare, education, energy, and environmental policies, our government will need to garner strong public support. However, rebuilding public trust will not happen in the face of a pervasive perception that government is not transparent and accountable, cronyism is rampant, and public officials are more interested in helping themselves than in serving the public good. Taking strong, swift, and decisive action to address abuses and begin to rebuild public trust should be the first priority for our city, state and federal government in the new legislative session. Create a Task Force on Public Integrity with a mission to develop a comprehensive proposal for ethics and lobbying reform in our city and state. Which addresses reforms in three areas: (1) strengthening enforcement of ethics, campaign finance, and lobbying laws; (2) strengthening civil and criminal penalties for abuses; and (3) improving awareness and education for public officials. Reinforce honesty, integrity and transparency by government officials as the core requirement to be and stay in office, any violations of these core tenets will cause the removal of the public official and the loss of “all benefits” retroactive. I think we should consider putting public official on a base salary plus commission based on performance. While the many of our elected officials and government employees are honest, dedicated public servants, the actions of a few create a dark cloud over all. Taking strong, swift, and decisive action to address these abuses and begin to rebuild public trust should be the first priority for our city, state and federal government in the new legislative session. We need honest government with integrity.